X Factor presenter Dermot O’Leary has claimed that his boss enjoys seeing him miserable. Speaking on ITV’s Lorraine this morning (Thursday), the X Factor host talked about his relationship with Simon Cowell. 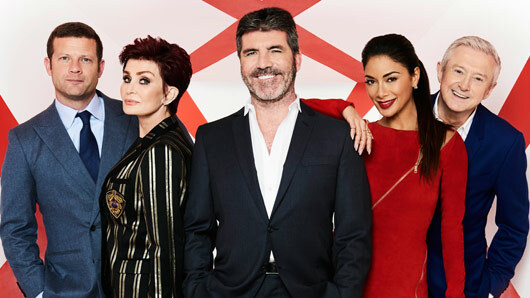 Dermot explained how he urged Simon to get rid of the Six Chair Challenge element to the show after seeing how nervous it makes the contestants. The presenter also voiced his own discomfort at watching this stage of the auditions. However, Dermot’s comments seemed to only please Simon. “He just said, ‘Great. Marvellous. We are definitely going to still do it’. Dermot continued to confess how he feels sorry for Simon, insisting that he isn’t as heartless as people at home think. “He’s softened a lot since becoming a dad. “Actually, over the last five years, you’ll rarely hear him say something mean. I feel sorry for him because he’s a warmer beast than people think he is. This weekend, Saara Aalto, 5 After Midnight and Matt Terry will all be battling to be crowned this year’s X Factor winner. And Dermot has said that it will be a particularly close call this year. « Is Calum Best joining Celebrity Big Brother?